« I found my Thanksgiving salad! I am trying to knock out some early holiday shopping to get it out of the way, and have found some fun trinkets. 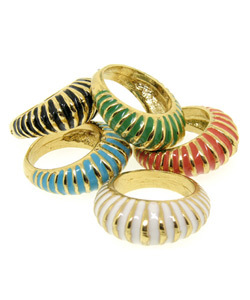 These colorful ribbed enamel rings from Leila remind me of the shrimp earrings my sister used to wear back in the ‘90’s! The black & white versions exude winter chic, while the colored options are fabulously festive. And at $50, everyone will be cheerful. This entry was posted on December 4, 2008 at 1:20 pm and is filed under Uncategorized. You can follow any responses to this entry through the RSS 2.0 feed. You can leave a response, or trackback from your own site.